The following lists show the non-divisional field artillery units assigned to USAREUR in June 1965 and their attachments to the various Corps field artillery groups. Please contact me for any corrections, additions, suggestions or comments. A wonderful schematic that appeared with an article by Oberstleutnant Dr. Bodo Hahn on the status of missile artillery in the early 1960s. I have taken the liberty of modifying the schematic slightly by highlighting some of the key points with color. I will go into more detail as I enhance this section with additional articles on the atomic artillery units of the 1950s, 60s and 70s. Click on thumbnail to view a larger version of the schematic. 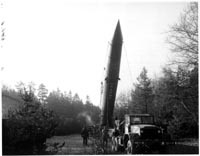 The 40th Missile Group, which was the first Redstone unit to arrive in Europe, became fully operational on 10 October 1958. 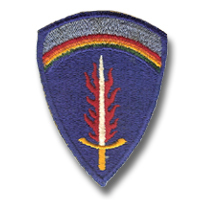 The second Redstone unit, the 46th Missile Group, was stationed at Neckarsulm in the spring of 1959; it achieved operational readiness by 31 May 1959. 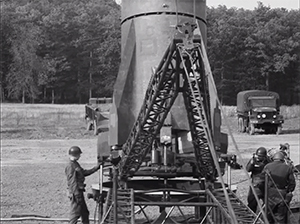 Soldiers of A Battery, 40th Artillery Group, in Eckweiler, Germany, raise the Redstone ballistic missile into firing position during a training exercise in December 1958. NOTE: Unit markings on bumber (40GP-F-RS 217F-A-38) indicated that the firing unit belongs to "A" Battery, 217th FAM Bn. The 217th was attached to the 40th Group at Redstone Arsenal prior to the Group's move to Germany. So -- is this actually a photo of the 40th Group prior to its deployment to Germany or did the Group deploy its equipment with the old markings??? 167th Ord Det (GM GS)(Lacrosse), Wiesbaden. 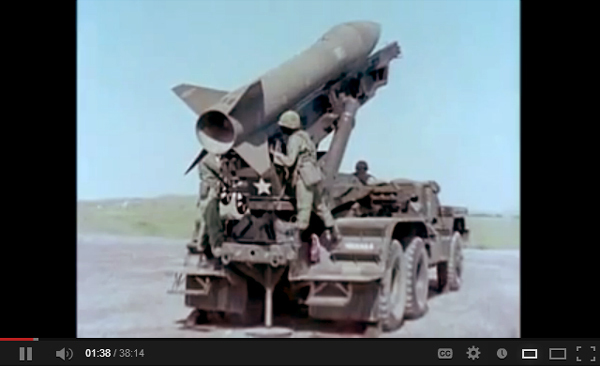 There was another guided missile in the 7th Army during the 1960's. It was the Lacrosse, a short range guided missile. 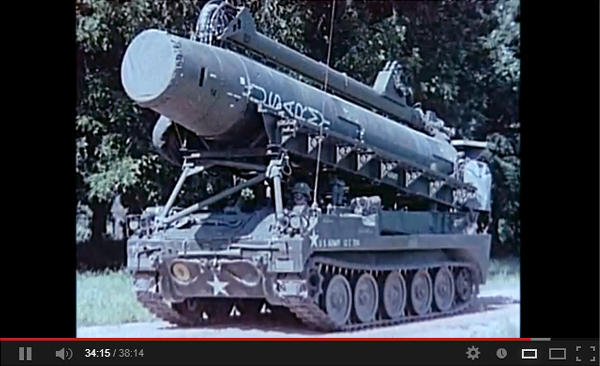 I was assigned to Hq & Hq Battery of the 5th Missile Battalion, 39th Artillery in Bamberg, Germany from 1961-1963. I remember well the train trip from Bremerhaven to Bamberg, with a stopover in Bamberg. We were outfitted with the Lacrosse. It was a winged guided missle, with about a twenty mile range. It carried either a nuclear or conventional warhead. It was very accurate (at least at Graf it was when our Bn. fired it). We were set to fire them from our motor pool during the Cuban Missile Crisis. That was the only time we ever fitted the Nuclear warheads to the missiles. 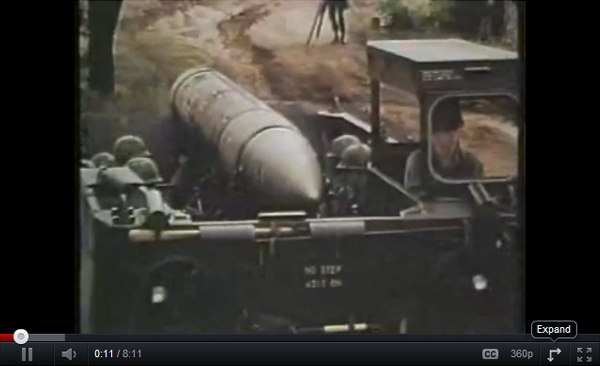 The 5th Missile Bn, 39th Artillery is the only one that I know of with the Lacrosse. I don't know when they were formed (as a Missile Unit), but they disbanded in 1963, after the Lacrosse was declared obsolete. I enjoyed Bamberg. It is a very historic town, which suffered virtually no damage during the war. I spent a lot of my time traveling aorund Europe, at the cheapest rates I've ever seen. The barracks were old Bavarian Army Calvary barracks, and had the stables in the basement/ground floor. Our Battalion was very small, and we used one large building, and a mess hall. When the LaCrosse was declared obsolete, our building became the Headquarters of the 35 Artillery Group. Next to the 5/39 was the 2nd Battalion, 35th Artillery. They had 155 towed artillery. When the 5/39 Artillery was brocken up, I was reassigned to the 2/35. Then, a couple of months later, it was re-designated the 1st Battalion, 75th Artillery. We were equipped with the brand new M-110 8" Self Propelled Artillery, with both conventional and nuclear capability. We had several of our guys wounded at Graf in 1964, when a shell went off about ten feet from the end of the tube. It was our first trip to Grafenwoehr (spelling) with the brand new M-110's. Scared the crap out of me, I can tell you! The Bamberg Military web page has a picture of Lt. Colonel Johnsrud (our Bn. C.O. 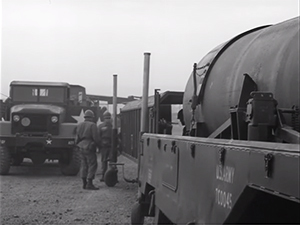 ), training people on the M-110 in 1964. We also had units of the 3rd Infantry Division, replaced by units of the 4th Armored Division; the 2nd Armored Calvry, along with the 82nd Engineers, while I was there (6/61-12/64). There was also an anti-aircraft missle Bn., and a bunch of other supporting units. I LOVED Bamberg. I would have done anything to get back there. I re-enlisted in the 1/75, and went back to the States in 12/64. I was assigned to Valley Forge General Hospital, where I spent most of the next five years. I kept submitting 1049's to get back to Europe, with no success. I sure loved it over there. My name is SGT Liscano, I am the Asst SGS at III Corps Artillery Headquarters at Fort Sill, OK. We are in the process of dedicating a building to COL William H. Hamilton. He commanded a Lacrosse Unit in the 60s but we have been unable to distinguish which one he commanded. I ran across the webpage and saw that you had some info on some units, and I thought I would ask. Your help would be greatly appreciated. Please feel free to email me. I tried to respond to the above research request asking which Lacrosse unit Colonel William H. Hamilton commanded in the 1960's. It was the 5th Missile Battalion, 42nd Artillery. I was in the Firing Battery of that Battalion and remember Colonel Hamilton. Me e-mail to the requestor, Sgt. Liscano, was not deliverable. I believe the 5th of the 42nd was the first Lacrosse unit in Germany. We arrived in Germany in March, 1960 and were stationed in Aschaffenburg. We did have nuclear capability and spent a great deal of time on the East German and Czech borders. I was a Spec. 4 - Guidance Crewman. The 5th of the 42nd was still an active Lacrosse unit when I was discharged in March, 1962. I was stationed at Bleidorn Kaserne in Ansbach with the 4th Missile Battalion, 28th Artillery (Lacrosse) from 1960 - 1963 and with the 1st Battalion, 68th Artillery (Sergeant) from 1964 - 1966. I am also Secretary of the 4th Missile Battalion, 28th Artillery Lacrosse Missile Association (1959-1963). Our third reunion is coming up in October 2003 in Lawton, OK. Please visit our website at http://hillsboro.net/users/lacrosse/. I've been putting together a "Book of Memories" for our next reunion and have gathered quite a bit of "stuff", including newspaper clippings from the Lawton Constitution. A bit of history: The Lacrosse Missile System came about as a result of a post-World War II requirement for a guided missile to supplement conventional artillery in close support of ground troops. The 4th Msl Bn, 28th Arty was the third Lacrosse Battalion to be activated and was assigned to the 1st Missile Brigade at Fort Sill. Lt Col Richard C. Morehouse Jr. accepted the colors from Gen Bruce C. Clarke, Commanding General of the Continental Army Command during activation ceremonies at Fort Sill on June 22, 1959. In September, Lt Col Morehouse was selected to attend the National War College and Lt Col Leo M. Blanchette Jr., assumed command. The 4th Msl Bn, 28th Arty left Brooklyn Army Terminal on 25 April 1960 aboard the Gen Maurice Rose, arriving in Bremerhaven 10 days later. Traveling overnight by train, the unit occupied Bliedorn Kaserne in Ansbach on the 6th of May, 1960. Upon arrival in Germany, the 4th Msl Bn, 28th Arty was assigned to the 210th Artillery Group with the mission of general support to VII Corps. Lt Col Joseph J. Matthews Jr., assumed command in 1961 after Lt Col Blanchette was reassigned to Headquarters, USAREUR. In early 1963, Lt Col Matthews rotated back to the States and Lt Col Walter Berthelsen took over, commanding the unit until its deactivation in October 1963. I believe 5 went to Germany and 1 went to Italy, but I'm not sure. I suspect that the reason the 4/28th was not included in the history of Bleidorn is because of the confusion caused between the 2/28th and the 4/28th having both occupied Bleidorn in close proximity. I spoke with the CO (then) of the 2/28th a few months ago. I think he is in the Tampa area but I'd have to check! my notes (if I can find them). In 1966, the 1st Bn, 68th FA (Sergeant), relocated from Bleidorn Kaserne in Ansbach to Schwaebisch Hall and was reassigned to the 72 FA Gp. I'm trying to regain the contact info from the 2/28th from a guy who was in both outfits so I'll let you know if I get it. Meanwhile, here's the partial rewrite. Hope you can use it. 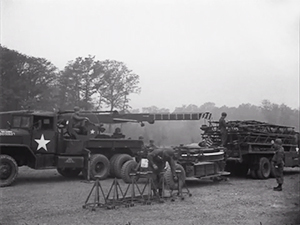 In the early 1950's, the headquarters of the 18th Field Artillery Group moved into Bleidorn, and was accompanied by the 979th FA Bn (155-mm). The 979th was later redesigned as the 70th Armored Field Artillery Battalion in 1955, and remained until around 1960. In the early 1960's, the Kaserne was the home of the 2d Bn, 40th Artillery, a Corporal Missile Battalion. This unit remained in the Kaserne until deactivation in early 1960. In May 1960, the 4th Msl Bn, 28th Arty, a Lacrosse Missile Battalion, arrived from Ft Sill, OK and occupied Bleidorn until deactivation in October 1963. The 169th Ord Det deployed from Redstone Arsenal in support of the 4th Msl Bn, 28th Arty. In August 1964, the 1st Bn, 68th Arty, a Sergeant Missile Battalion arrived from Ft Sill and remained at Bleidorn until it moved to Schwaebisch Hall in 1966 where it was reassigned to the 75th Artillery Group. In mid-1966, the 1st Bn, 75th Arty, stationed at Hindenburg Kaserne, was redesignated the 2d Bn, 28th Arty (Webmaster Note: originally reported as an 8-inch Howitzer, but Barry Miller corrected it - 2-28th was an 175 mm Arty unit) and relocated to Bleidorn. In addition to the 2d Bn, 28th Arty, several smaller units have occupied the Kaserne since 1966, including the 501st Military Police Company and elements of the 793d Military Police Company. 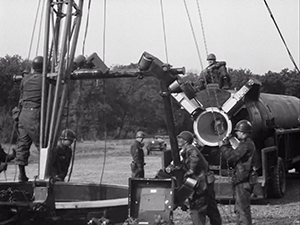 The phaseout of the CORPORAL missile system would be accomplished according to the original schedule, with the activation and deployment of the six authorized US SERGEANT battalions to be completed between June 1962 and June 1964. The first three US battalions would be activated by 30 June 1962. Another battalion would join the group by 30 June 1963 with activation of the last two by 30 June 1964. The phase in of the SERGEANT would then be completed with deployment of one battalion to the Pacific, one to the Strategic Army Forces, and four to the US Army, Europe. The number of MAP (Military Assistance Program) battalions remained unchanged, the plan calling for three German double-strength battalions (i.e., with four firing batteries instead of two) and one Belgian battalion. Though not yet stabilized in design and support capabilities, the SERGEANT weapon system issued to the field in 1962 fulfilled its military objective as a drastic improvement over, and replacement for the CORPORAL missile system which had been operational since 1954. Briefly, the SERGEANT's mission was to attack and destroy major targets deep in enemy territory, such as large troop concentrations, nuclear delivery systems, communications centers, and command and supply installations. Its 75-mile range, its all-weather delivery capability, and its choice of nuclear, biological, or chemical warheads would enable the corps commander to wipe out enemy threats at a distance and of a magnitude far greater than was possible in World War II or even Korea. The SERGEANT was fielded in battalions of two firing batteries, each having one launching station. Each firing unit, or battery, had its own survey, communications, maintenance, and administrative personnel, and could thus operate at distances far from its battalion headquarters. 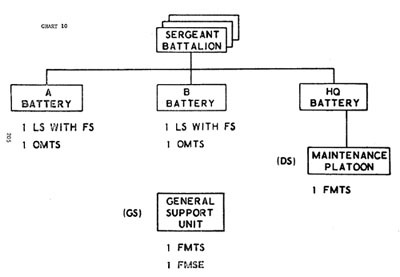 Backing up the launching station, normally in a separate area, was the firing battery's OMTS; and backing up the latter, in a central battalion location, was the FMTS of the organic Direct Support Unit (DSU), later redesignated as the Missile Maintenance Platoon (MMP). Except for a change in the number of US and MAP units, the tactical deployment of the SERGEANT weapon system was accomplished essentially according to the plan laid out in late 1961. The number of authorized US battalions was increased from six to seven, the planned Belgian (MAP) battalion was cancelled, and the number of double-strength German (MAP) battalions was increased from three to four. Between June 1962 and September 1964, all seven of the Army battalions and their support units were equipped, trained, and deployed -- one to Fort Sill, Oklahoma (Strategic Army Corps), five to Europe (four in Germany and one in Italy), and one to Korea. Deployment of the original three MAP battalions to the Federal Republic of Germany (FRG) was completed in 1963-64 and the fourth in 1965-66. The CORPORAL weapon system was phased out of the field as SERGEANT units became available. Inactivation of the first European battalion occurred on 31 March 1963. 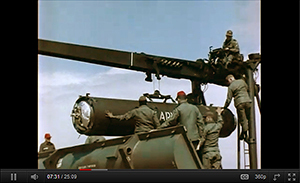 By 10 June 1964, all of the CORPORAL missile maintenance technicians had left the Seventh Army and the last CORPORAL artillery unit was inactivated on 25 June 1964. March 1963 The first U.S. SERGEANT battalion was deployed overseas. 1963-1964 Three Military Assistance Program (MAP) SERGEANT battalions were deployed to Germany. September 1964 Between January 62 and September 64, all seven Army SERGEANT battalions and support units were equipped, trained, and deployed: one to the Strategic Army Corps; five to Europe; and one to Korea. 1965-1966 The last MAP SERGEANT battalion was deployed to Germany. 23 June 1970 The four U.S. SERGEANT units in Germany were reconstituted as two double-strength battalions. 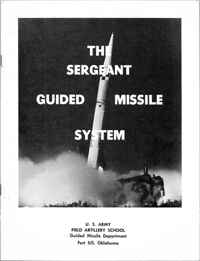 A pamphlet created to provide students at the US Army Field Artillery School with an unclassified reference outlining the organization, capabilities, operations, and methods of employment of the Field Artillery Battalion, Sergeant. 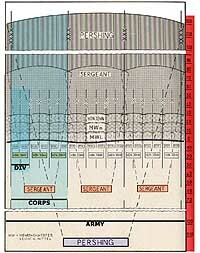 The Sergeant system is considered primarily a nuclear delivery system; therefore, in the discussion of tactical concepts the field army is assumed to be deployed for a nuclear war. The following lists show the non-divisional field artillery units assigned to USAREUR in September 1970 and their attachments to the various Corps field artillery groups. Please contact me for any corrections, additions, suggestions or comments. The following lists show the non-divisional field artillery units assigned to USAREUR in June 1976 and their attachments to the various Corps field artillery groups. Please contact me for any corrections, additions, suggestions or comments. 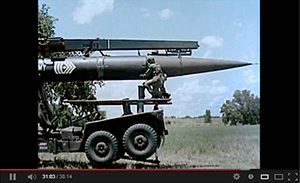 The LANCE was developed as a mobile surface-to-surface weapon system in 1962. The LANCE was a mobile field artillery tactical missile system used to provide both nuclear and non-nuclear general fire support to the Army Corps. Designed to attack key enemy targets beyond the range of cannon artillery and to reinforce the fires of other artillery units, the LANCE replaced the HONEST JOHN system and the SERGEANT system. It filled the U.S. Army’s need for a highly mobile, medium-range, fin stabilized, all weather, surface-to-surface missile weapon system. 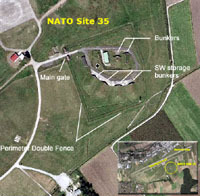 The LANCE’s primary mission targets included enemy missile firing positions, airfields, transportation centers, command and logistic installations, critical terrain features (defiles, bridgeheads, main supply routes, etc. ), and large troop concentrations. 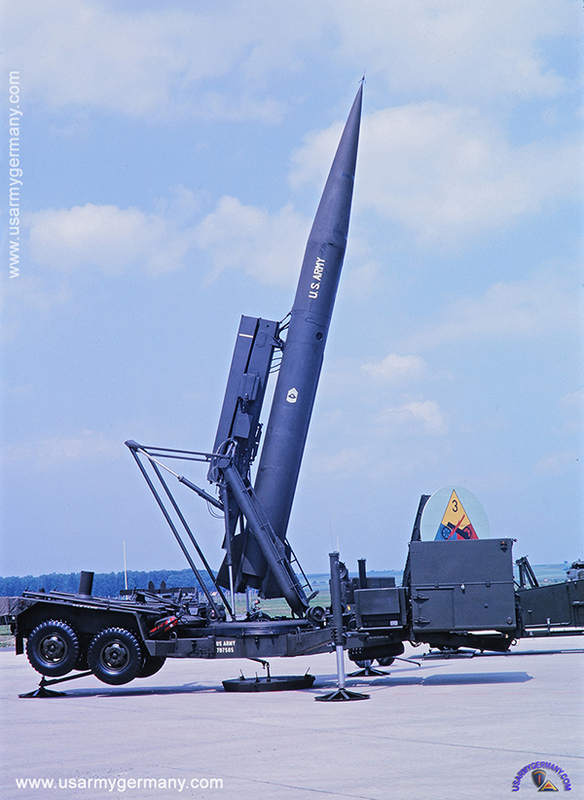 Unlike other Army missiles that use solid propellants, the LANCE used a prepackaged, liquid fuel that eliminated any need for fueling in the field and gave the LANCE a short reaction time. It was capable of delivering nuclear warheads out to a range of about 75 miles and conventional warheads to a range of about 45 miles. The missile system briefly gained notoriety as the "neutron bomb," after the Washington Post reported on the Army’s development of a warhead for the LANCE that would kill people but cause minimal destruction of property. The enhanced radiation warhead was designed to release within a restricted radius great quantities of neutrons which attacked the human central nervous system. The warhead would also reduce the heat and blast effects of conventional nuclear warheads, thereby reducing the destruction of buildings and collateral damage to civilian populated areas. 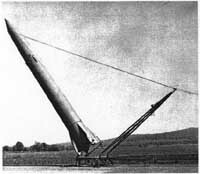 Officials believed that the LANCE enhanced radiation warhead would deter a Soviet attack by threatening the U.S.S.R. with a weapon that could be used without destroying the Federal Republic of Germany in order to save it. Congress approved production funds for the new warhead on 13 July 1977, but President Jimmy Carter deferred production of the neutron warhead in April 1978. 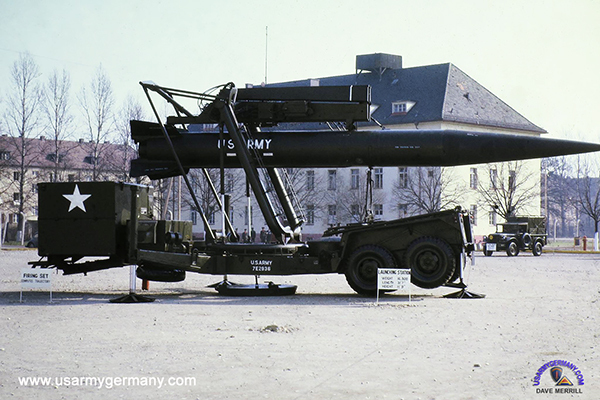 LANCE missile production was approved in September 1970, and the first battalion (1st Bn, 333rd FA) was fielded to the U.S. Army, Europe (USAREUR) in September 1973. At that time, the system achieved its initial operational capability (IOC). Less than two years later, the first full-scale deployment of the LANCE to a foreign military sales (FMS) customer was accomplished. Once it was fully fielded, the Army had eight LANCE battalions, six in Europe and two in the United States. LANCE was also sold to NATO allies and to Israel in the non-nuclear version. Originally scheduled to be retired in the mid-1980s, the LANCE system was extended through 1990. DA subsequently decided in June 1985 to extend the nuclear-only LANCE shelf life to 1995. However, on 27 September 1991, President George Bush announced a unilateral cut in nuclear weapons, which was followed on 5 October by a similar announcement by President Mikhail Gorbachev of the U.S.S.R. Although the Soviet Union collapsed shortly thereafter, the United States later reaffirmed this nuclear arms reduction agreement by signing a treaty with Russia, Belarus, Kazakhstan, and Ukraine on 23 May 1992. The final LANCE battalion stood down at Fort Sill, Oklahoma, on 30 June 1992. After being demilitarized, excess LANCE missiles were set aside for use as targets. 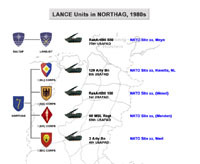 23 May 73 Equipment for the first LANCE overseas battalion was shipped to Germany. September 73 The first LANCE battalion—the 1st Battalion, 333rd Field Artillery—was deployed overseas, achieving IOC for the system. FY 1974 Four LANCE battalions (2-42; 2-79; 1-80; 3-277) were activated and one SERGEANT and five HONEST JOHN Battalions inactivated. March 75 The first full-scale deployment of the LANCE system to a foreign military sales (FMS) customer (Italy) was accomplished. 1st Bn, 68th FA (SGT), Dolan Bks, Schw. Hall, and 3rd Bn, 80th FA (SGT), Ludwig Ksn, Darmstadt, were the two units that were inactivated with personnel and equipment being transferred to the remaining SERGEANT battalions. (1) As part of the the New Manning System that the US Army implemented in 1981, the Army also redesignated many combat, combat support and combat service support units under the US Army Regimental System (USARS). The purpose of USARS was to maintain the distinguished histories and traditions of the surviving regiments and to foster a sense of belonging and unit identity by affiliating soldiers with a regiment throughout their careers. 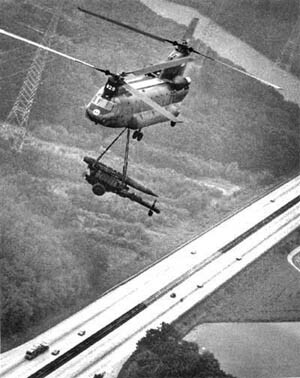 After a two-week, 4,560-mile journey with three other Chinook CH-37 helicopters from Fort Carson, Colorado, to Heidelberg, one of the choppers lifts a LANCE rocket and launcher over the autobahn and the Neckar River in a show of deployment capability. 3rd Battalion, 12th Field Artillery inactivated quiety Oct 15 without the usual fanfare associated with the tnd of an era. The Lance battalion said its formal goodbyes to Aschaffenburg in a farewell and awards ceremony Aug 16 as a prelude to its inactivation. 3rd Bn, 12th FA is part of the Army-wide lance compression (concept) changing the face of field artillery from three-by-two (three batteries with two launchers apiece) to a three-by-four (three batteries with four launchers each) configuration. "Many of the soldiers looked at the compression as an opportunity to see a concept develop," lance battalion commander, Lt Col Dwight Gray, said. "This concept was on the plans of USAREUR headquarters several years ago," Gray said. Under the new system, a battalion is almost the same size, but has twice the firing capability as a battalion under the old system, battalion executive officer, Maj Hal Nyander, said. "You have a larger number of delivery systems in one battalion so Command and Control is streamlined. One headquarters controls more assets. We don't need as many people in Command and Control to deliver the fire," Gray said. "There were six Lance battalions, and we're down to three now." 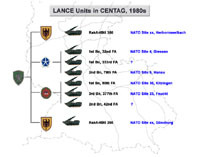 The lance compression, completed June 30, sent three launch platoons to 1st Battalion, 32nd Field Artillery, in Hanau along with the support personnel and equipment that goes along with those launchers, Nyander said. I need to do a bit of digging for details, but I can flesh out a bit of info as to FA units in VII Corps in 1976. As your site shows, 1/18 FA and 1/30 FA were stationed from CONUS to Augsburg in 1976. However, they were NOT the first ICCE Corps Arty units to do so. When ICCE began, the first units to deploy were 1/17 FA (155 SP) and 2/18 FA (8-inch SP) from Ft. Sill, OK. I was a 2nd Lieutenant in A Battery, 2/18 FA and deployed on what was to be a six month TDY tour to Germany. What better way to get out of the hot sun at Ft. Sill for the summer! I believe we departed in April or May after turning in our equipment at Ft. Sill. A replacement unit, 1-12 FA was to stand up and take our old stuff. 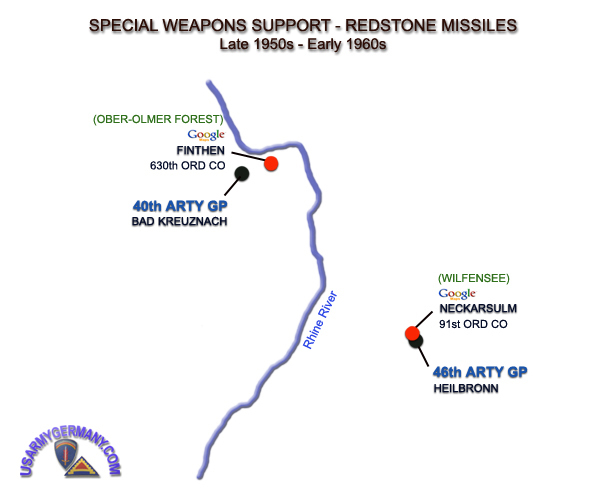 We deployed to Kaiserslautern-Pirmasans area and drew our equipment from the POMCUS sites in that area. The wheeled vehicles then convoyed from K-Town to Augsburg. I had the "luck of the draw" as the Senior 2LT to be in "command" of the train with all the tracked vehicles belonging to the battalion. Luckily, the Senior NCO in charge of the driver's party took charge of the troops. He told me to just stay comfortable in my private compartment and not to worry about a thing. Despite how it sounds now it was a relatively uneventful trip. The only disturbance was when someone threw something out of a window while we were in a railyard and the station master had a fit. We calmed him down and made it to Augsburg after about a 12 hour ride. The Battalion Commander met me at the railyard and the job of detraining and moving the tracked vehicles to the motor pool commenced without much assistance from me. In Augsburg, the 1/17 FA was sent to Reese Kassern and 2/18 FA was sent to Sheridan Kassern. Our motor pool looked quite a bit like the open area in the photos on the 17th FA Bde link. Though they had not paved them when we were there. They were freshly covered in gravel. We shared Sheridan with a Tank Bn from 1AD. They were at Graf when we got there, so the Redlegs filled in at the NCO & EM clubs in taking care of the ladies they left behind. When the Tank Bn returned, the inevitable skirmishes broke out, leading to the requirement to have a Staff Duty Officer make the rounds of the clubs to "keep a lid on." Before deploying to Germany, we had heard that the troops at the front did PT every morning. That was not routinely done at Ft. Sill. So the unit started doing PT in the mornings before we left so we would be ready to get it right when we arrived. Once we did arrive, we formed up for our first morning run as a Battalion and started out with relish. We were "hi-hi-heeing in the field artillery" at the top of our lungs at 0630 around Sheridan Kassern. When we got done we really knew we had done something the same as the boys in Germany and felt we had held up the "honor" of Ft Sill Redlegs everywhere! However, the other tenant unit sharing our area of Sheridan Kassern was an Army Security Agency Unit that worked at the Intel Site at Gablingen. They worked 8 hour shifts over a 24 hour day, so many were sleeping just getting off shift. We were told that we could no longer make such a racket as the ASA soldiers needed their sleep! We had previously noted that the big, luxurious Mercedes passenger busses were sitting outside of the 24 hour dining facility. Something we had never seen before. The busses at Ft. Sill were the beat-up Army style busses that had no AC and no springs. We had wondered who the tourist busses were for!! Well, I think we may have cut back on our PT a bit, and found a route that took us off post most of the way, but we most certainly enjoyed making at least one pass around the quad to make sure the ASA boys knew we still loved them. While at Sheridan Kassern, the two FA Bns belonged to VII Corps Arty. Your site says it inactivated in 1975, but I think that may not be correct. I remember that the Corps Arty Cdr was still on Sheridan Kassern while we were there. Don't recall his name right now. Our Battalion went to Graf for two weeks and to Wildflecken for two weeks. I remember those, not for the opportunity to get to the field to train, but rather for the fact that we did NOT get TDY money while we were in the field! It was right after we came back from Wildfleken we heard that the Army was going to stop the six month rotation concept. The unit scheduled to replace us (1/30 FA) was being sent over to replace us early. I suppose that was to allow them to arrive in time to get their kids in school or whatever. But we were leaving early, so that was not too bad. They asked for volunteers to stay and join the new unit upon arrival. You would get tour credit for the TDY interval if you did. I heard that the Bn Cdr for 1/30 FA was only going to be in command for 6 months as he had been scheduled to leave after his original six month tour. Don't know if they replaced him before the unit arrived or not. We had some soldiers stay, but most did not. Too hard on their families to do that. Interesting side note about 1/17 FA and 1/18 FA. In the 70's VOLAR Army, you could enlist for station of choice, or unit of choice. And at Ft. Sill, 1/17 FA was the unit of choice offered to soldiers from Arkansas. They had big red razorback hogs painted on the side of their guns. The Battalion Commander's Jeep had a red razorback hog painted on the panel holding the windshield of his jeep with the words "Head Hog!" the 1/18 FA was the unit of choice for soldiers from Texas. They had the Lone Star State flag painted on their guns. During this time, all units in the US were mostly painted in olive drab, but emblems were painted in color. The only decorations I remember on the equipment belonging to 2/18 FA were that the 4 M110's each had one of the 4 playing card suits on their tubes (spades, hearts, clubs, diamonds), but these were done in black. I will try and find my TDY stuff to get you the dates. And somewhere I have the hand receipt where I "signed" for the train with all the tracked vehicles on it. Boy was I worried about how I was going to pay for the damage if anything happened while we were moving. But my NCO told me: "Don't worry El-Tee, I will take care of everything!!" I believed him, and he did just as he said. As far as I know. Use what you want out of this. Hope it helps a bit. I am impressed with what you have done. Sure brings back great memories! Atomic Veterans History Project, 1953-2003 - Purpose of this web site is to record the compelling stories of the atomic veterans across the country. The Atomic Veterans History Project has now collected about 500 personal narratives of these awesome events as witnessed by those who were there. We invite atomic veterans to join the other fellows who have recorded their atomic duty.